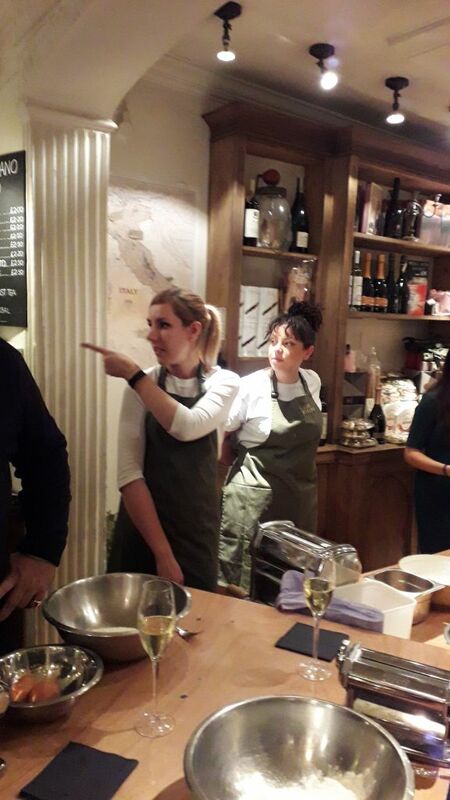 Set in a ‘modern pasta factory’, deli-café and wine store from Angela Hartnett we gathered to learn the art of pasta making. Pastificio runs pasta-making workshops, wine tasting events and Italian regional supper clubs in a good-looking shop space. Beautifully presented by Emma and Carla there was plenty of hands-on demonstration and helping hands with the dough and flouring. It’s unexpectedly peaceful, making pasta, and once we got mixing, the room went quiet with our Zen-like concentration. Gently folding the glowing eggs from chickens fed with corn & marigolds into the flour. Not too wet but not too dry, firm kneading but not so much as to make the dough tough and not too much stretching as to make it glutenous. Once prepped and rested it was time to roll it out, turning and laminating (doubling it up). You’re supposed to run the pasta through the machine until it’s the thickness you need. Mine kept growing Pinocchio-style so that it took three of the other pasta makers to support it as it keep churning out the roller. Think pasta snakes on a plane! 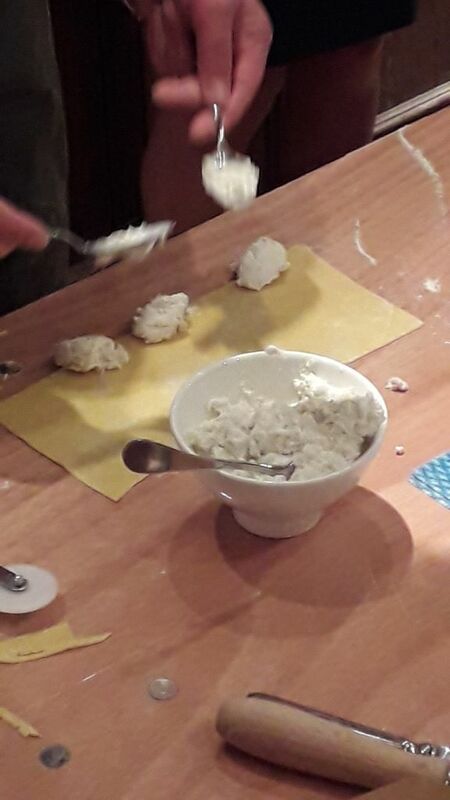 Once folded over and in a haze of flour we set out making three types of pasta shapes – spaghetti, ‘bow-tie’ farfalle and ricotta-stuffed parcels. 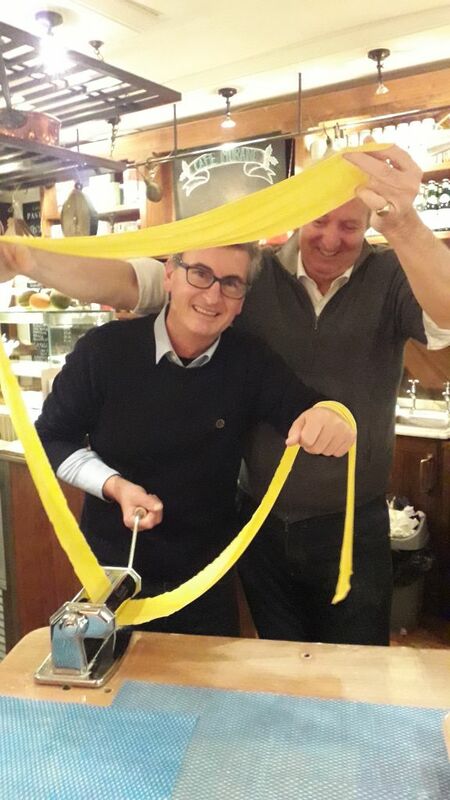 Making long pasta is like playing the guitar – or zither in my case. 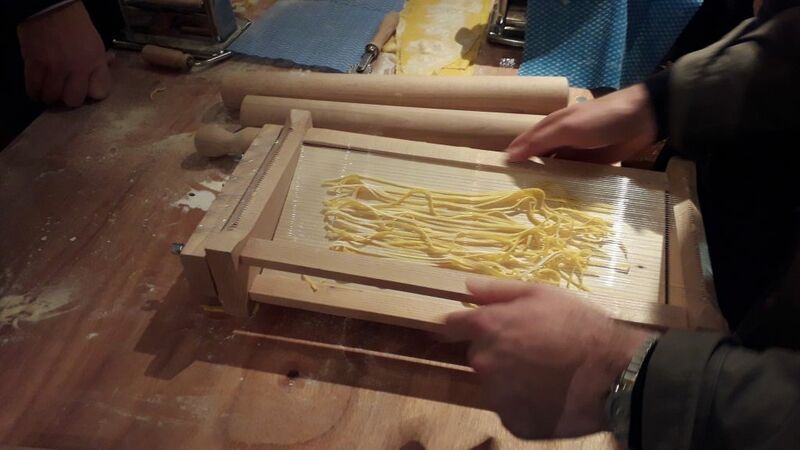 The pasta sheet is stretched over the ‘chitarra’ and rolled back and forward until it’s cut and drops through the strings. Not quite as easy as it sounds, this took a lot of effort to get some uneven, ropey bits of pasta carefully arranged into a nest that looked like it’d been dragged through a hedge. Carla said they had just made extra long pasta for a riff on Charlie Chaplin’s City Lights spaghetti scene. The way I played that guitar you’d be lucky be to get a mouthful never mind a room full of spaghetti streamers. Strumming the chitarra making pasta! Well, on to the farfalle and some wounded butterflies that emerged unformed from their yellow chrysalis. Again, really easy to make once you’ve been shown how – index finger in the middle of a square of pasta with the thumb and middle finger drawing the edges together. The dilemma was size and to crimp the edges or not. So I made a bag of mis-shapes just to prove their authenticity. 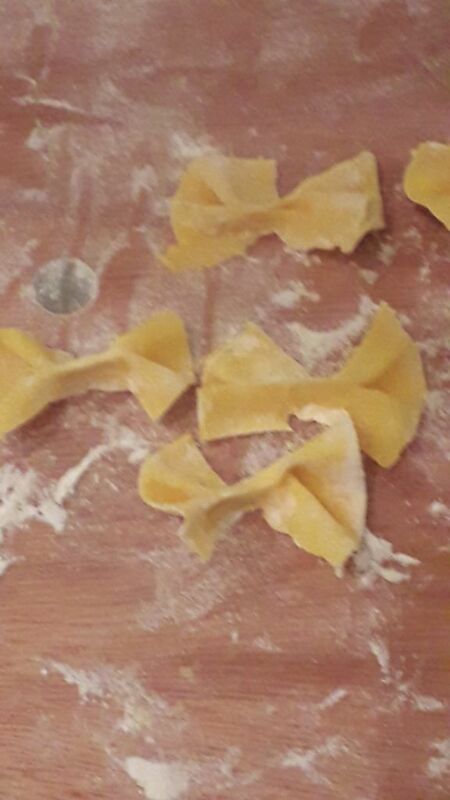 Farfalle – pieces of pasta shaped like bows or butterflies’ wings. Then some great tips for stuffed pasta – all in placing the filling at the edge, measuring two fingers between parcels and sticking down the pasta with water. All so simple, and so satisfying. Two hours flew by in this very enjoyable experience. With the pasta making course comes a discount in the store where they have great gift hampers and jars of the best quality Italian treats such as truffle and artichoke pesto. You also get a discount in the buzzy restaurant next door, Cafe Murano. So with my bag of foodie goodies, sauce and my box of hand-made pasta I settled down in the restaurant. Quite pleased with myself, I offered the pasta to the waitress suggesting the chef might like to cook it for me. Leonora, a super Sicilian, replied that she didn’t think that would happen with this chef. After a perfect supper there I had to agree, there’s no way Michelin-starred, Chef Patron Angela Hartnett MBE would ever dream of creating such unusual shapes. Tickets are only £50 and well worth it! 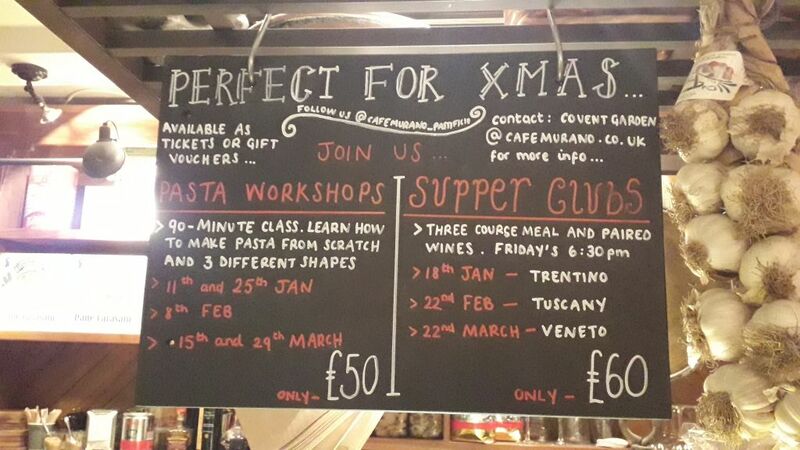 Come and join Emma & the team for a 90-minute class and learn how to make fresh egg pasta from scratch – a perfect gift!